The 20-year-old US-American beats Mikael Torpegaard in the singles final. Jeffrey John Wolf clinched his first title on the ATP Challenger Tour. 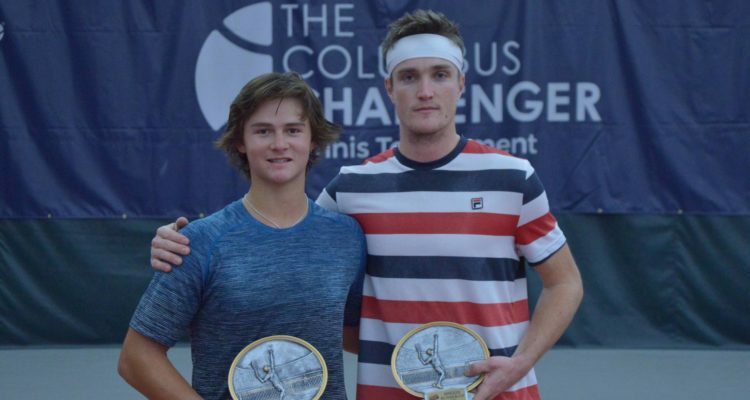 The 20-year-old US-American lifted the trophy of the January Columbus Challenger held at the Ohio State University with a total financial commitment of $54,160 on Sunday afternoon. In his first final at this level, Wolf defeated fellow wild card entry and 2016 champion Mikael Torpegaard of Denmark 6-7(4), 6-3, 6-4. The Ohio native sent down seven aces, winning 67 per cent of his first service points and broke his opponent three times to prevail after two hours and 12 minutes. Following his maiden Challenger triumph on home soil, Wolf earns $7,200 in prize money as well as 80 ATP-Ranking points. “I am very proud and excited to have won my first professional ATP Tour Challenger here in Columbus – my second home! And against a talented, tough and extremely accomplished good friend, former teammate and competitor Mikael Torpegaard. I also want to thank all my coaches for their hard work and commitment to my development, as well as my teammates for their support. I wouldn’t have been able to accomplish this goal without them,” Wolf said. On Saturday, Maxime Cressy from the United States and Bernardo Saraiva of Portugal took the doubles title. The unseeded duo defeated the all-US-American combination of Robert Galloway and Nathaniel Lammons 7-5, 7-6(3). The final lasted one hour and 29 minutes. This entry was posted in ATP Challenger News, ATP Challenger Tour and tagged ATP Challenger Tour, Columbus Challenger, Jeffrey John Wolf.